Id Software’s Doom Resurrection is now available for the iPhone and iPod touch. It’s a $10 download from the App Store. Blast demonic hordes in this action game for your iPhone. An all-new first person shooter action game created exclusively for the iPhone platform, Doom Resurrection uses art assets and concepts originally developed for the PC and Mac game Doom 3. The game features a total of eight levels in an advanced graphics engine designed from the ground up for the iPhone and iPod touch. Scientists on a remote outpost on the planet Mars have lost control of their experiment, and demonic monsters are pouring through an interdimensional rift that’s opened up a portal to hell. It’s up to you to stop their ruthless advance. You use all the weapons at your disposal — everything from a chainsaw to a shotgun, assault rifle and more — to keep the monsters at bay. 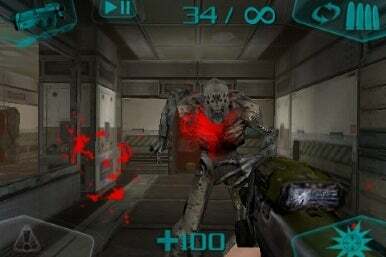 Doom Resurrection was unveiled earlier this month as Id Software’s “secret project.” The game has been developed with Escalation Studios, an iPhone game developer co-founded by Tom Mustaine, a veteran of Doom-based games. System requirements call for iPhone OS 2.2.1 or later.